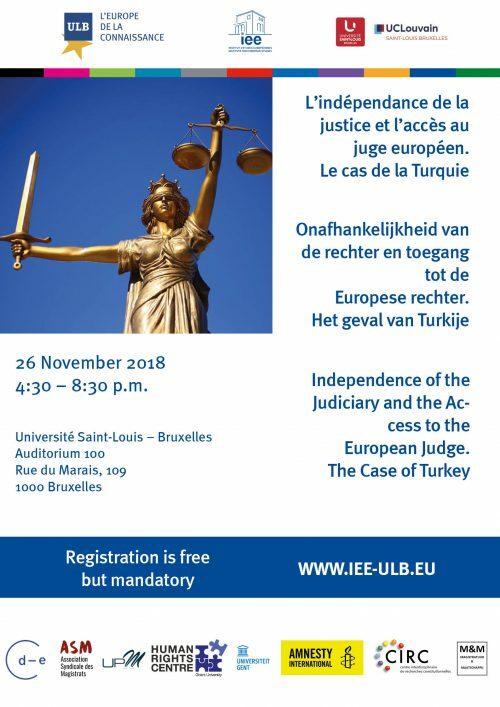 On 26 November, the Centre is organising with other organisations, a conference on the independence of the Judiciary and the access to the European judge, with a particular focus on the case of Turkey. Related questions concerning the Rule of Law Backslinding in the EU will not be overlooked. The independence of the judiciary from the other powers constitutes, to quote a well-known judgment by the Belgian Court of Cassation of 14 October 1996, “the foundation, not only of the constitutional provisions on the judiciary but of any democratic state. The litigants find in this principle the guarantee that judges will apply the law equally”. The right to an independent tribunal is not a fundamental right like the others; it forms a sine qua noncondition of the other rights’ effectiveness. A systemic threat to the former therefore entails the risk of a structural collapse of the latter. Turkey is currently facing such a threat. The objective of this afternoon session is to critically assess this phenomenon in the light of the applicable European standards. By contrasting the points of view of academics and practitioners, the session will aim at measuring the whys and wherefores of the situation in Turkey. A more general reflection will also be made, on this basis, on the reaction of the European judge in the face of such systematic deficiencies. The event will chaired by Emmanuelle Bribosia, the director of the CDE, and Françoise Tulkens, the former Vice-President of the European Court of Human Rights. Cecilia Rizcallah will intervene, with Sébastien Van Drooghenbroeck, on the sources and the scope of the right to an independent tribunal. More info (including the program) and registration here.